We all know the thrill of singing this great work with a full orchestra - the power, the glory, the chills up your spine. But the original version isn't exactly designed for children's voices. 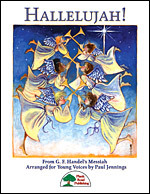 That's why we have created a new setting of this classic especially developed for young choirs. It is in a lower key, and is arranged for two treble voices. As you would expect, we are also providing a superb recording featuring full orchestra with both a full performance and just the accompaniment. There are also special rehearsal tracks to help each part learn the music. A Special Prologue For Extra Drama! To add a special touch to your performances, we have also added a short, special prologue with an air of anticipation and an optional narration. The recording is designed so that you can perform the work with the prologue or with the original opening to the work.